ONGC OIL AND NATURAL GAS CORPORATION LIMITED Recruitment 2016 Apply online|ONGC Recruitment 2016 – 417 Chemist, Geologist, Materials Management Officer & Various Vacancies – Last Date 10 August|ONGC Recruitment 2016|Oil and Natural Gas Corporation Limited (ONGC) invites application for the post of 417 Chemist, Geologist, Materials Management Officer & Various Vacancies Through GATE-2016. Apply Online before 10 August 2016. For Chemist : Post Graduate in Chemistry with minimum 60% marks. For Geologist : Post Graduate Degree in Geology with minimum 60% marks. For Materical Management Officer : Graduate Degree in Engineering in relevant branches with 60% marks. Selection Process : Selection will be based on GATE-2016 Score & Personal Interview. 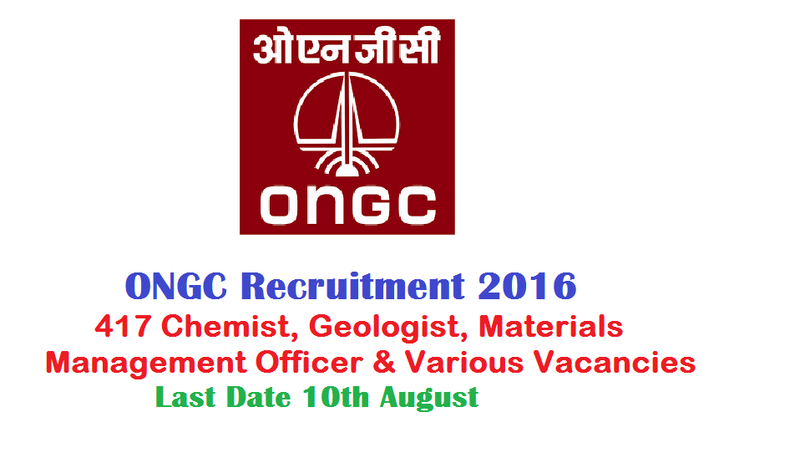 How to Apply ONGC Vacancy : Interested candidates may apply Online through the Website http://www.ongcindia.com/ from 28.07.2016 to 10.08.2016.